A species is exotic and invasive when introduced outside its range is a nuisance to native plants, health and/or the environment. Once established, it is very difficult to eliminate it, so it is important to prevent its introduction and control its spread. The Memphrémagog MRC has been added to the regulated zone in respect of the emerald ash borer. 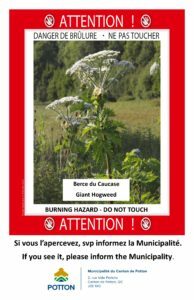 This implies that it is now forbidden to move any product from the ash tree, such as logs, branches and wood chips, as well as all species of firewood from the affected areas. Zebra mussels, considered an invasive exotic species, were found in Lake Memphremagog. The zebra mussel quickly colonizes water bodies to the detriment of native molluscs. It does not affect the quality of bathing water, but it clings to hard surfaces and can cause damage to infrastructure, including water intakes. This news confirms the importance of cleaning boats when changing water.